Take only photographs, leave as few footprints as possible. 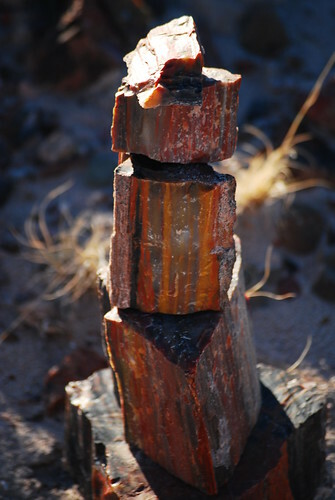 That's the message of the National Park Service, especially with regards to the crystal trees of the Petrified Forest. Like the lava of Kilauea, there's a purported curse, and you see letters on the walls of the visitor centre detailing the bad luck that's befallen those who've walked off with pieces of the brightly coloured rocks. Someone still wanted to make their mark on the park, and on the edge of the self-guided hike near the visitor centre we spotted this little cairn.